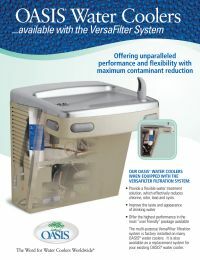 The OASIS® VersaFilter is easily accessible from inside the cooler for fast and easy filter changes. An automatic shut-off inside the filter eliminates the need to locate the water valve. Durable constructed, VersaFilter is designed to last 1,500 gallons or approximately six months. Spun polypropylene prefilter wrap extends the life of the filter by protecting the media from premature plugging due to sediment. Unique formulation of powdered carbon plus a patented lead reduction media for high performance filtration. Compression molded into a tight block for maximum contaminant and cyst reduction. Triple O-Ring seal ensures no bypass. Radial flow-through filter design utilizes entire media area for maximum performance and minimal pressure drop. 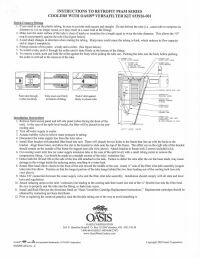 Patented shut-off valve engages automatically as filter is inserted or removed. Self-contained sealed cartridge ensures that hands do not touch the filter media reducing the potential for introducing bacteria.